The Account Master has a standard list of ledger accounts, which are generally required by an individual user. You can start entering your data just by adding an account name and by selecting any of the pre-defined groups. You must specify a correct group name in the account master to give correct effect in the final accounts. You should also enter the opening balance in case of an asset or a liability account. Creating account results in addition into your list of ledger accounts, and the account created will be added in the Account Master for all periods. 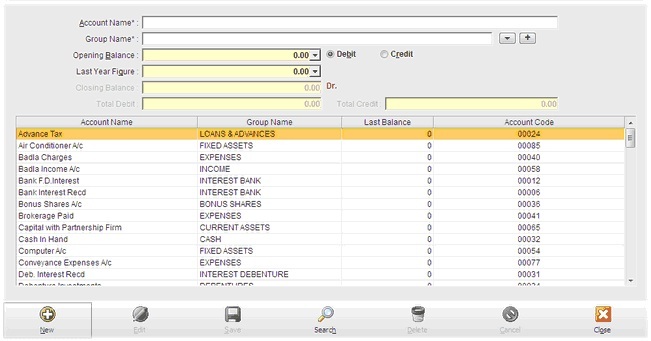 Show Account on Desktop : Invest Plus also gives you a facility to display some of your important account details directly on the Desktop module given in the front, to do that right click on the account list after which an option would appear ‘show account in Desktop’, on clicking that option, Invest Plus will automatically display all the details of that account on the Desktop. Name Enter name of your account. Maximum length is 30. Opening Balance You can enter opening balance if any in Account either balance is credit or debit. Closing Balance Display Closing balance.